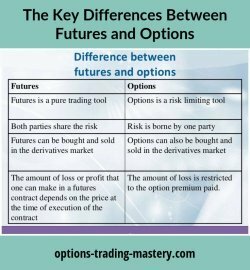 You may have wondered about how futures and options are different from each other. You're about to find out how. Both are called 'derivatives' because they derive their value from an underlying market. Both involve leverage, exercise prices and expiration dates. But there are some fundamental differences between futures and options that are so significant that they affect the level of risk involved and consequently, how you should use them. A futures contract is an agreement to exchange items at an agreed future date. The items are usually commodities, currencies or stock market related items such as indexes. In fact, the commodities market is essentially a futures market which is driven by the need for large companies that use goods such as precious metals, agricultural products and resources, to ensure that their future purchases of those items are at guaranteed prices. This helps them to construct reliable forecasts of financial budgets. But this has also opened the way for speculators to trade against the fluctuating commodity prices without ever intending to own the products. Speculators might be happy to buy and own 1,000 shares but they are most unlikely to want to have 1,000 barrels of oil or 10,000 tonnes of sugar delivered. Futures vs options trading is very simple. A futures contract creates an obligation to buy or sell physical goods at a future date. A bought (long) options contract however, creates a right but not an obligation to do the same. But if you write (short, sell) an options contract, you have given someone else the right and YOU have the obligation. This 'obligation factor' in both cases, creates potentially unlimited risk that is magnified by the leverage that comes with derivates. Let's say you agreed to sell 10,000 bushels of corn in two months time, for $710 per bushel. You're not a farmer and don't own that many bushels - you are just a speculator with the equivalent in cash. In the meantime, major natural disasters cause the international price of corn to rise dramatically, so that the market price is $800 per bushel by December expiration date. Your futures contract now forces you to still sell the corn at $710. Since you don't own the corn, you have to buy it at $800 and sell for $710 making a loss of $90 per bushel. At 10,000 bushels this represents a $900,000 loss. Ouch! If the price of corn had gone higher, your loss would've increased accordingly. Just run the numbers again. Potentially unlimited! This is the number one distinguishing feature between futures vs options. Options contracts on the other hand, are exactly that - options, not obligations. When deciding on futures vs options, a trader should know that, unlike futures, options carry limited risk. The most you can lose when you buy call or put options, is your initial outlay. Call options allow you to call on others to deliver; put options allow you to put (sell) your product to others - both at agreed prices. So even though the outcome is similar to futures in terms of delivery of the product, the structure and obligations with options are different. With options contracts you pay a premium for the right to the end result. With futures contracts, you pay or receive a small down payment towards the end result. Since a down payment becomes part of the ultimate value there is effectively no entry cost apart from brokerage. An option premium on the other hand, is a cost to be deducted from the end result. Another difference between futures vs options is the way leverage works. With futures, the leverage is $1 for $1 all the way. For every dollar the underlying price action moves, you either make or lose a dollar. As such, they are the perfect hedging instrument. But with options, it all depends where the current market price is in relation to the exercise price. At-the-money option contracts usually have a leverage of 0.5 that is, for every dollar the underlying moves, you make or lose 50 cents. But as the contract moves deeper into the money, the leverage factor increases, up to a maximum of 1.0. This factor is called the "delta". Deep-in-the-money options have a delta of 1.0 and move in value like futures. Out-of-the-money options only contain "time value" and consequently, their delta is much lower. Instead of buying or selling futures contracts, we can construct options positions which have the changing value of futures contracts as the underlying security upon which the options prices will be based. These are options on futures. This way, you can effectively harness the leverage in the price action of, for example, 500 oz. gold, using gold options but with limited risk if the price goes against you. Understanding the difference between futures vs options allows us to determine how we will construct our positions for maximum effect. 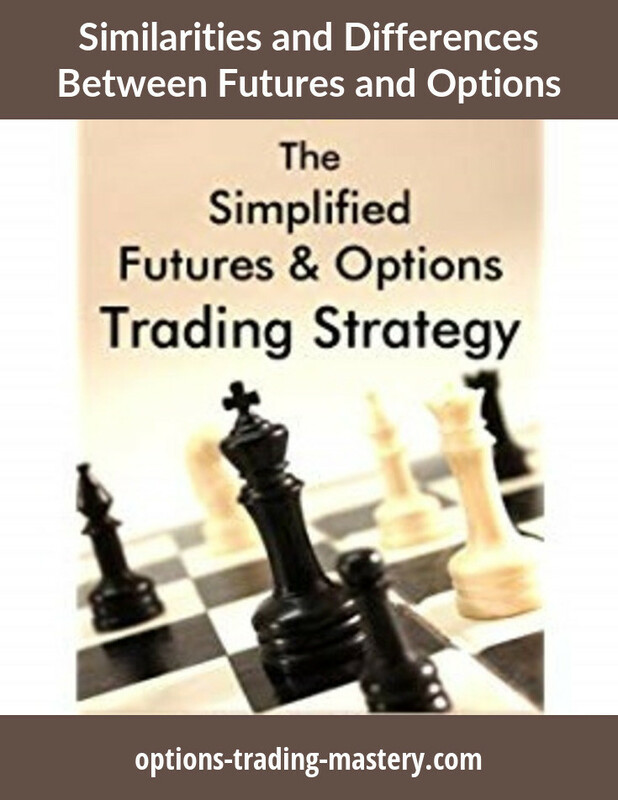 Options are much more versatile and complex than futures and this allows us to create great option trading strategies that take advantage of things like "time decay" or price volatility.